Food Reviews, Recipes, and Guide to Better Dining. NOT in any particular order. One of my favourite bite of the year has to be a warm freshly baked Thomas Haas's Almond Croissant. Worth going to their store and waiting for a new batch to be brought out. I guarantee you won't be disappointed. Almost everything is amazing at the store. The croissant is available at selected 49th parallel and at La Faux Bourgeois cafe. I also love their hot chocolate and pull a-part as well. Hey, I am a member of PETA. Yes! bluefin tuna's are on the endangered species list. But as a PETA(Person that Enjoys Tasty Animal) member I can concur that it is sinful to enjoy eating o-toro. Vietnamese beef rolled in la lot leaf and grilled 3 course. Fun food to eat with close friends. This is a messy but worthwhile affair. There is the Bo 7 Mon, but I don't care for some of the other 4 courses. The pastry is divine. A flaky crispy semi sweet baked dumplings filled with cooked turnips. Too bad I am not crazy about this restaurant. But would love to try this again. For many people there are four seasons. For foodies and chefs, there are so many more seasons. Besides the weather seasons we have seasons for food items like asparagus to look forward to in spring. There are matsutake season, spot prawn, etc... Though there no real Alaska King Crab season. I always look forward to AKC 'season'. When prices for this royal crustacean drop from a high of 39.99/lb to 9.99/lb. This Lucky Tao version has the best deep-fried version. Better than Phnom Penh's chicken wings. Can't wait for king crab season..!! Ahhh simple and nice afternoon tea treat. Love this bun and the milk tea at Lido. This is one odd item. I don't even know for sure how to order it. I have to describe it every time I order it. But I always enjoy it when I do get it. It taste somewhere between calamari and geoduck. It's interesting! I also like the 'water' crab congee and the chi chow congee here. This is an interesting dining destination. Out of the hundreds of chicken dishes this year, this was probably one of my favorite chicken dish. The chicken was succulent ,moist and tender. It wasn't salty despite the name. Would love to revisit but this place is busy now and u really need a reservation. I've tried twice to get another report but they were busy bit times. By comparison I ended at the other Chinese restaurant in this hood, they were almost empty. Probably one of the most expensive Italian meal I'm the city. But absolutely worth it! I wouldn't hesitate recommending Cioppino's for their food. There are always excellent moments. Its hard to pick one item of their menu from my two visits. But I choose the risotto because it couldn't have been done better on this visit. Risotto's are made daily so while I can't guarantee it will taste exactly when you visit. But I am sure you will get some wow from your table guest. Santouka's pork jowl is near melt in your mouth goodness. This Japanese ramen-ya chain consistently makes a very good pork jowl. I really enjoy the texture. The pork jowl is suppose to go with your bowl of ramen. Santouka is currently considered one of the top ramen-ya is Vancouver. And while they make very good Ramen. I would be happy to eat this pork jowl with my homemade instant noodle. This pork works with any savoury, salty broth. Santouka is famous for it's shio(salt) ramen in Japan. It also happens to be my favourite broth. I also always prefer my noodles 'with a bite'. To ask you can say, 'katame de onegai shimasu'. Is that correct? What I really want to know if you are suppose to drink the ramen broth or not. Do you drink the broth? I believe the larger version of this ramen is $12.95. Do you like chicken Tandoori? Well, chicken 65 is the southern version. It is a two step process in making chicken 65. Many recipe's call for deep frying the chicken in a spice and corn starch mixture first. Than frying more spices and curry leaves, to which the fried chicken pieces are added in to the spice mix pot. This version has 16 ingredients that the chicken is flavored it. What I like about Dakshin's version is that the chicken is not or at least does not taste deep fried. The chicken has a spicy and tart taste. The spiciness comes from the spices and chillies. And tartness comes from the lemon and yogurt. An incredible appetizer that will please anyone. I'll take this chicken 65 over any tandoori chicken in Vancouver. At $8.95, the portion is generous. BTW, if you are wondering why the chicken looks so red, it is because it contains food colouring. When you order you can specify what heat level you want the chicken to be. So I imagine it is possible to request sans red food colouring, if you prefer your chicken more au natural. Lovely crispy Chinese pancake rolled with sliced tender five-spice beef, scallions, and a northern fermented bean paste similar to hoisin. The pancake is flaky and crispy - A ménage à trois between a croissant, roti canai and green onion pancake. For those not into red meat or wanting an alternative option, their Potato Roll is excellent. It is exactly the same pancake but rolled in julienned potato mixture. Thanks to Fmed and Grayelf for introducing me to this place. First off, sorry if my last post sounded very one sided. Actually I am very pro food blogger. I just wanted to post a point of view. A restaurant-er asked me today if it it's true that today food blogger are more significant than print media review/ad. More specifically if a good food blogger experience would bring more customers in their doors than traditional methods. There is no doubt that technology has changed the way many people choose their dining destinations. Besides food bloggers, companies/websites like Yelp, Urbanspoon, Chowhound and Open Table has given diners alternative when it comes to choosing restaurants and making reservations. Food bloggers and online foodies that report their experiences offer a more current outlook of a restaurant than the traditional print media. Every individual's palate is different, so no matter how wonderful even a gourmand think a dish is, there will be differences of opinions. As a chef or industry professional you need to learn to detect your customer's preferences. As much as I hate to suggest it, but many successful restaurant listen and make changes to accommodate their core paying customers(target market). About a decade ago I created a menu that included Pad Thai on the menu. I tried to be 'authentic' but inevitably the tomato ketchup laden pad thai sauce was unceremoniously the one that went on the menu. I even had to reduce the fish sauce and added oyster sauce to make it 'better'. FWIW, the restaurant won a new restaurant award. Sigh...! Today most people have a better idea what Pad Thai is. And would prefer a more authentic version. What I like about food blogging is that individuals can decide which blog to follow. You are not restricted to one or two opinions like traditional print media. I apologize if I rattled some feathers. There are 12 days left to X'mas. So i figured I will try to end the year with 12 notable dishes of the years. This are 12 memorable food items I had this year in no particular order. The smarter one's embrace and brown nose them. As this would be best for business and career. But from my observations most are apprehensive. Cook's by nature, are more introverts. If they prefer and are good dealing with people they would be servers or front of house staff. A good FOH staff is generally more valuable than a peasant cook. Sure there are exceptions. The exception is that the poor bugger looks like crap. Most cooks I've met are miserable SOB's. Let's face it, waiter's and bartender's make better $$$. Only a fool would slave in the kitchen, or a swine. Sure, there are lot's of progress made in the industry and there are a few celebrity chef's. Even food empire's run by someone that apparently started in the kitchen. You've probably seen, Babe: Pig in the City http://www.imdb.com/title/tt0120595/ , you probably thought the pig was so cute. Well it was. That pig was in a freakin movie! How many pigs get to be in a movie. How many cooks even get to be a chef? Not many apparently. Most of the best cooks I've worked with and met, never want to be a Chef. They would rather work in their own domain, where they have more control regarding their daily routine. While many people assume that the primary ingredient to being a great Chef is the ability to cook. The business reality is that a Chef's biggest role is to part of a profitable enterprise. Most of this skills are not covered in your 'Chef school'. What give's the right to an utter unknown or anybody that can sign up for a free blog account to make comments about a chef's work. A chef who has worked and risked so much(including some possible flogging). A chef has to endure so much just to get there. Now a 'no name' nobody who thinks they are food lover or presumably knowledgeable in food because they ate better food than their peers. Because they were born with a silver spoon and never gone to bed hungry decide they want to 'share' their food knowledge with the world. Chef's and especially cooks only wished he had your dining budget. Cooks who get by with the restaurant's staff meals' and leftover carbohydrates for years and years. Saving their hard earned paycheques for other necessities like rent, and wal-mart clothing. So how was your day at work today? Did you a have good day? Sent out and replied to all your e-mails. Made all your calls you were suppose to. File all the documents correctly. Hope you didn't leave any work left undone. Imagine if you did? What would happen. Probably no biggie. Nothing you cant fix when you get in tomorrow, right. Imagine if head office sent in an 'efficiency' expert. And the said 'expert' came and observed your work. It's a long weekend. Stressful week, kids just back in school. Parents visiting. Your basement got flooded. Darn it. Was suppose to get that fix earlier. Now you get home and just realize you forgot to sent the attachment to the bank for a pending loan for the company. Oops!. Never done that before. Sure you figure some way to fix it. But not before the 'efficiency' expert makes note of it and post it on the world wide web so your kids, parents and co-workers know you made an honest mistake. It's one thing to have a customer make a remark to a server who then passes it on the the chef. But to have a moment of your work judged and immortalized, can be unnerving. IMHO, having a moment of your work judged and immortalized on the world wide web albeit positive isn't really fair. It doesn't really reflect who you are and what you are made of. There are so many factors that come into play when it comes to cooking and food. As is with the variables that come into running a food service environment. People who think that being a chef is a great career should never be a guidance counselor. It would be like hiring an alms dealer to general an incumbent war. If your kids say they wanna be Chef because they like eating. Tell your kids to be a food blogger instead. They eat better than most Chef's. So I did ask a chef what he thought of food bloggers. The answer was, "I don't really pay attention to them. It doesn't make a difference to what I do or make. I have my own standard and accountability". Amen. Been a while since I had a chance to write anything. Mainly due to the fact that my laptop 'died'. I was in the middle of writing something when my dear laptop's motherboard got fried. Have tried to get it fixed under warranty but got declined, and assessed a quote of $700+ to get the laptop fixed at Sony. To be fair they claimed I had damaged the laptop. Which is true. But there was no guarantee that the laptop would work if i chose to spend that money to get it fixed. Have been back to Santouka Ramen 5 times. And find that now that the trainer's have left, the quality had slipped a little. When I go, I will specifically asked to have my ramen noodles cooks al dente with a bite. As I have found that by the time the noodles reach the tables they are a tad too soft for my liking. Also found the miso broth a little saltier for my personal preference. Have been back to Baguette and Co 4 times. Bernard is very helpful and thoughtful and still trying very hard to improve his business. I do like most of the breads here. Though the products cannot compare to the top bakeries in France. Their honesty, sincerity, and keenest to do their best to help you is very much appreciated. He continues to hire French bakers that understand the art of baking. My search for the best croissant in the city will be updated soon. I had a forgettable take out meal from Alvin Garden. Hence I wouldn't recommend it if you live far from the restaurant. Best to eat in at the restaurant. I was surprise to see Alvin Garden at no 1 spot of urbanspoon site. This is not a typical restaurant that would get much perusal on urbanspoon considering it is Hunan cuisine, or for it being located on imperial drive, Burnaby. After the initial Nine Dishes post, DylanK post, comments and discussion that followed on chowtimes and chowhound, this place got really busy. If's Nine Dishes also got some write up in the Chinese blogs and media. It was fun to watch the chaos as it unfolded and but frustrating as a guest or customer. At the peak of the madness people would have to wait 30 minutes or more for a table. I was lucky every time and never had to wait for a table. It is still a fun place to dine in a very casual environment. I was never wowed by the food. But was always impressed with the unique experience. The music has changed but the food is still the same. If(the owner) is till standing tall and presiding over his Beijing-Szechuan watering hole. Still $2 yanjing beer and $3.50 Asahi beer. Chambar - have been back a couple of times. Both for birthday dinners. Once just for drinks. The service was good both times, considering it was a bigger group. We were seated in Cafe Medina for one of the birthday dinners. Pretty consistent food and drinks. I did re-read my post and hope that people understand my comment are generally thought provoking and not meant to be hurtful in any ways. Great to be back. Look forward to sharing more thoughts and reports soon. Hasta la vista, baby! Chambar serves French/Belgian/North African influenced cuisine in an unpretentious environment. There are no dress requirements or restrictions like most Vancouver restaurants. Though most guest have a trendy fashionable disposition, in their late 20's to early 40's. Most people I've spoken to have been impressed by Chambar's long narrow dining room. I find it stylish but haven't found anything that makes me go, 'wow!'. However, I did find some of the seats uncomfortable. Sorry, just being honest. I like the vibe and environment plus the mix of people that gather at Chambar. As usual I like naming names of the people behind the restaurant. In particular the food. After all great food doesn't happen by itself. It's the people behind the food that makes the 'magic' happen. No two cooks cook exactly alike. Therefore if you change the cook, the end results are different. It really cannot be over emphasized, especially in finer dining restaurants. How one individual person can make a good meal - into a great meal. It really is like magic. The Chef and owner Nico Schuermans was born in Rwanda, Africa. His family moved back to his native Belgium where he apprenticed and worked at a couple of 3 star Michelin Restaurants. He started his apprenticeship in his early teens. Before opening Chambar, he worked in London, Puerto Rico and Australia. It was in Australia that he met his current wife and business partner Kari. While Nico takes care of the back of the house. Kari manages the front of house including the local art work on display, that changes every 4-6 weeks. Eleanor Chow, the pastry chef is one of the rising pastry chef in the city. She has continued to improve and refined the dessert at Chambar. And also at Chambar's baby sister Cafe Medina, where Eleanor's Belgian Waffle accompaniment of compotes, caramel and chocolates sauces are sinfully delicious. The front of house team members has changed over the last 6 years, some leaving to explore other opportunities. The current bar program is lead by Wendy McGuinness. My most recent visit was on DOV 2010. The reservation was for 9pm. Which I assume possibly meant that there were possibly two group of diners ahead of us. One at 5pm and the other at 7pm. That's super busy for a weekday night at a finer dining restaurant. Most of our group arrived promptly at 9pm. The host who normally is cheerful and smiling, ushered to our table promptly. Felt a bit rushed. Menu were placed on the table. They had the regular menu plus a 3 course DOV menu for $38. They also had a couple of add-on's at additional charge for the DOV menu. Good options for food. The initial service was prompt and acceptable. Do you ever notice how the server acts after you answer the question, "would you like a drink to start?". I always pay attention to how the behave particularly at 'finer dining' restaurants. And I like to see their reaction and how they attend to you after. I have experienced poorer service when the table orders less in general. But normally if your table drinks and spend money, the service gets better. Perhaps it is a coincidence or maybe the alcohol makes you think the service is better. He he.. well no doubt server's live off their tips/gratuities but that inconsistency really bugs me. Anyways, 3 of the 6 of us ordered a drink. It was a weeknight. After taking our initial drink and food order, our server appeared maybe three or four times the rest of the night. Chambar is well know for their Moule Frites. Which is a great pairing with the mussels. Chambar serves the largest sized fresh mussels in the city. Seriously!. You will never find one this big in your neighbourhood markets. Nico certainly has cornered the market for large mussels. Bloody chef's and their connections with food suppliers, always getting all the prized seafood. Leaving us the leftovers for our home cooked suppers. :-D . The mussels here are probably the best in town. And the $22 regular serving will fill most bellies. I normally order the mussel as a share item with others. And always upgrade to poutine. Since you can get similar quality fries at a few places but not similar type of poutine anywhere else. On to the main courses. Again three options or either the beef tangine, halibut, mussels(done either vin blanc or congolaise). The add on option was a AAA rib eye steak for an extra $10. The rib eye had a nice presentation as far as rib eye steak presentation goes. But it bewildered me why the steak was served pre-cut. I guess they were willing to risk releasing the flavor of the nice meat juices in favor of a nicer presentation. Or I look really old and they thought I needed my food cut up. Which would have been a nice gesture. Except I really love my meat juices. As caring as a friend can be, I love the flavor of meat jus, and that is something I don't share. When it comes to meat juices and flavor, I am selfish and not caring. :-D Whilst the additional cost was reasonable, I didn't particularly think the cut of rib eye I received was particularly well aged and I found it too sinewy. Under the poor lighting conditions, and based on the texture of the meat, it seemed like I was eating a very well prepared flank or side skirt steak. Truly far off the best rib eye steak I've had. But not bad value considering it would have been $48 with an appy and dessert. The rib-eye could have been better handled and prepared. The halibut was OK but cooked till a tad dry for my preference. And the risotto wasnt much to talk up or rave about. It was decent. I had higher expectation for the short rib tangine. I have had the regular tangine at Chambar and find it a tad too sweet for my liking. Short rib seems like a good cut to do a tangine with. I was a little disappointed when I tasted the short rib and the accompaniment. The short rib was neither tender nor flavorful to my taste buds. It was like eating poached lean brisket in some gravy slurry. The accompaniment was better but a tad boring compared to the regular tangine. I actually liked the rib eye steak better. The frites and poutine was good. The last time I was here, the poutine was a tad cold by the time it got to the table. Today it was hot. I like the blue cheese instead of cheese curd and the 'gravy' is yummy and could have used more gravy on the side for me personally. And I prefer my french fries crispier, that is a personal preference. For dessert there was two options OR a cheese plate. The dessert were solid. I think the winner was the chocolate pecan torte. Which was rich and decadent without being overtly sweet. And the passion fruit parfait was just nicely sweet and tart. It was a nice ending to the meal. Both presentation of the dessert looked good offered contrasting flavors. It gave diners options and the addition of a cheese plate is brilliant. Not everyone loves dessert. Not everyone love chocolate. Unbelievable as it may sound, some people just don't have a sweet tooth. I don't remember the cheese that was offered nor the option to choose what was offered. Sorry!. One was creamy and rich, maybe a goats milk camenbert-ish, the other was a more robust and stronger flavor profile. Good contrasting choice of cheese. I preferred one cheese and one of my dining companion preferred the other cheese. The bread was OK and probably great with the cheese. But I cant recall the flavor. Maybe a tad sweet. It was getting dry and crusty-ish by the time I got to try them. The bread was acceptable. "We know that it’s attractive during times of economic uncertainty to get a $25 or $35 meal, however the dining experience is also important. Experienced Dine Out patrons know that the two-week event means limited menu choices, surly service staff, and quick turns on the tables. We don’t feel right about shuffling people through Chambar to eat the same 3 options for two weeks. There is a reason we dine out, it’s to be in an atmosphere where we can escape for an evening to enjoy great food and service. If you haven’t had a chance to dine at Chambar for a while, you’ll notice something different when you walk into the back dining room. Where there was once a solid wall is now a narrow antique door from Egypt. Through this door is the restaurant’s new cozy dining room, which holds about 40 people. With its massive windows looking out to the Vancouver skyline, this new room is the perfect place to warm up with some moules frites and ask to sample our other new addition – Chambar Ale, it’s brilliant. p.s. If you’re looking for value for money, we’re still cheaper than Earls." end quote. Overall my food experiences in Chambar has been very consistent.The service was off the mark prob due to dine out. Felt bad for the server and some staff, but should I be? I am still a paying customer. Shouldn't that be the manager's and owner's obligation to deal with that so I can enjoy my experience. Kari had it right last year. Too bad she caved in this year and did do DOV 2010. Should have stuck to her guns. Either ways she exposed her restaurant to some new potential customers and made some $$ while at it. Good for you Kari! The menu and food has pretty much stayed the same for 6 years. The service can be spotty at times. I will probably begrudgingly return to Chambar. It would not be my first choice in any circumstance. Whilst it is a solid destination in every category and fulfills most elements in dining out. It does not have any outstanding areas(except best mussels) that makes it a must go for me personally. Plus, I know at some point, someone will want to have dinner at Chambar, and I can use this conveniently to dine at Chambar, without admitting that Kari and Nico have done a tremendous job making Chambar a success. :-D Happy eating y'all! What defines a great kitchen or restaurant? To some in the Food channel era, maybe watching Hell's Kitchen you may get a sense that you need a great leader like a Gordon Ramsay that demands perfection, that pushes his team to their full potential. Ensuring every cook gives 110 percent every night for the paying guest. Whist this may be reality TV show. I've never encountered such an environment. In my professional experience, whether cooking fine dining for 25 covers on a Monday night, to cooking 350 covers on a Mother's Day brunch, some things are very relevant. You need focused intensity when preparing and plating food. The kitchen is like a zen garden. Where you leave your problems behind, once you step into the kitchen. And you commit to your role and perform the task required as well as you can and asking for help if necessary. Whilst it is great to push boundaries and demand more from each individual. Service time is not the time and place to be practicing new skills or techniques. It is a time of precise timely execution. It is a time when every team member is harmoniously and symbiotically working together. Trusting each member of their team in executing their task with zero complications. An environment where open communication and camaraderie is welcomed. I do agree with Gordon Ramsay, all that matters is the guest's dining experience. The leaders in most professional kitchen are not drill sergeant's; rather they act as facilitators. Ensuring that his team has the required resources, skills and ability to execute at that level. I believe you always talk up the positives publicly and deal with the negatives privately. Oh yeah, here is my report on Kimura Sushi. :-D Located South of 22nd Avenue and on Rupert Street, Kimura Sushi is a potential hidden gem. If you drive on Rupert Street, chances are you may miss the sign hidden behind a tree. It has only been opened 3 weeks. And in the soft opening mode when I dined there. At the heart of the operation is Kimura-san. Who has worked in the US, China and Japan in various Japanese restaurants. He certainly appears to have quite a sushi making pedigree. His last restaurant in Santa Monica was popular with the more discerning sushi eaters in SoCal. After decades of working, owning and running Japanese eateries, Kimura-san says that this is his retirement sushi shop. I am not an expert in Japanese cuisine, nor even an expert in Japanese food. I can only based what I say on my limited knowledge. Kimura-san clearly demonstrates a proficiency in Japanese cuisine. He deftly wields his knife as efficiently as a samurai warrior. Each slice with a clearly defined task. When I asked him about his sauces and ingredients, he rarely hesitated to share his knowledge. Even going as far showing me his special order Konbu(Kelp) from Japan. And he uses a blend of White Miso Sauce and Red Miso Sauce to yield a delicious tasting sauce that he serves with several items including the ankimo(monk fish liver). was a good decision for me. As I got to see Kimura-san at work. The restaurant was roomy and adequately furnished. One of the attraction for me was the advertised Jazz music playing. The idea of perhaps John Coltrane, Ella Fitzgerald, Wes Montgomery, Cannonball Adderley, Ornette Coleman, playing in the background while I ate well prepared nigiri was very inviting. But that never happened. Instead all I heard was the voices of the servers and other diners all night. And never made out a single song that was playing all night. I did notice a collection of maybe 30 Cd's sitting on the shelve. From a distance I recognized a couple of the the CD's. While I wouldn't have mind not enjoying music if the occasional conversation with Kimura-san wasn't constantly being disrupted by the service staff. He meticulously tried to focus on trying to prepare each nigiri but is clearly distracted by what is going on around him. It is evident that the staff is struggling to understand his ordering system. Thinking about it, there seems to be a struggle in the front of house about their individual roles. Rather all three seemed to be doing all the task required with varying degrees of success. IMHO, assigning roles and responsibilities would be better than doing it by committee at this point. Will pay attention on this on my next visit here. Kimura-san works without a printed or written receipt. Rather he cuts the fish as the server reads the orders to him. With the struggle with his service staff this night, I politely enquire about his family. Thinking that all he really needs is his wife or someone that has worked with him and understand his system. Kimura-san mentions that his wife is in Japan right now. And his son has no interest in this line of work having been 'Americanized'. Which is something I hear often by immigrant parents. They seem to think that their kids are spoiled when they inherit North American values. Too bad. Was thinking maybe he can adopt me. Since I really would love to learn to make great Japanese food. he he.. His system is certainly old school, replaced by point of sale systems(POS) that prints the appropriate receipt at each cook's station. I notice all three servers communicating orders and information to Kimura-san at various points in the night. Understandably he is a busy man. Besides being the sushi chef, he is also the expediter too. On to the food. There are three menu's: one for the hot food, one for the raw food and sushi and a third is the Omakasse. I was informed that the oven was broken and needs to be fixed. So no Omakasse tonight. Bummer!. There is a 'soft-opening' special which consisted of 15 pieces of nigiri, rolls and mini udon for $13.95. Which was a great introduction and reasonable I thought. Kimura-san brushes each nigiri in his special mix of soy, mirin, sake, and sugar. Which means there is no need to add soy sauce for me. Although I noticed that some pieces could have used more sauce and the brushing wasn't consistent all night. Small detail, mind you. Of the special combo. The red tuna, scallop and fresh eel really stood out to me. The avocado in my California roll tasted like it been sitting out too long. But notice that the avocados used all night were directly from a fresh avocado, cut to order. Meaning none were cut ahead of time! Which equals fresh. Small observation. Ordered another round of nigiri. The deep fried shrimp head on the amae-ebi was fantastic. Kimura sushi uses ingredients that are better grade than your average mediocre sushi joint. Especially on this side of town. And it shows, the short grain rice were really fat. And the sauces were made in house using good to great ingredients. Sadly there is no real wasabi. And there is no o-toro, yet. He informs me that in a few months when he is more settled, he will add o-toro. I tried ordering uni(sea urchin), but was dissuaded by Kimura-san as it wasn't fresh enough to be served. Which is a great touch. Instead he suggest some flounder fin and monk fish liver. The flounder fin was thinly sliced with precision and placed on a shiso leaf. It was denser in texture and had a bit more bite. I asked for some ponzu sauce which he willingly provided and added a dash of something that I could not detect. Monkfish liver is certainly an acquired taste. And is certainly something I order at most Japanese restaurants I visit. Sort of a barometer of how well the cooking is in the kitchen. Like ordering har gou(shrimp dumpling) at a Canto dim sum restaurant. But this time he suggested it to me. His version is lighter and more melt in your mouth than some others than have a denser texture. I really liked it especially with the miso sauce he served it with. I really wanted to enjoy my meal but was distracted just as much as the staff and Kimura-san with some of the challenges. It bothered me more so because I can relate to to their feelings. NOTE: the service was never bad throughout the night. The intention and sincerity was there. The comments on service were largely due to inexperienced and being newly opened. Can certainly see the frustration in the staff and Kimura-san. Some things take time. I am hoping the opening jitters will soon past and they can move on to being a successful restaurant. While sitting at the sushi bar, I noticed the tools and knifes Kimura-san used, in particular his 'plating chopticks' stood out, it was really neat looking. Half metal, half wood. Will take a picture next time I am there. They do take-out orders. Though I highly dissuade anyone from ordering take out here. Unless you live next door. As most of the items here are not great take-out items. I was disappointed that Kimura-san was making inside out rolls for take out customer last night. Nori needs to eaten immediately. Once it touches the rice the texture and flavor changes. Oh well.... I suppose there is always folks that love to order their take-out California roll. Kimura-san never did take out in his previous California restaurants. Partly due to fear of lawsuit of eating raw fish he tells me. Overall my food experience was positive. And I really enjoyed sitting at the sushi bar and chattting with the Kimura-san. Whom fortunately wasn't anything like Gordon Ramsey. He was patient and trying to find his zen state, despite being questioned by a server if he remembered the entire take out orders. Perhaps she fears he may forget an item. Just who is running this place and signing your pay cheque, young lady? This man sure is patient. Especially considering this was his retirement sushi joint. Will return when he works out the kinks and have his full complement of menu items. the service needs improvement. especially to be considered a mid to higher end restaurant. music volume level was too soft, and was drowned out by the few folks talking. need to work on their system and billing better. Will likely return and recommend to others. East of Main Street in Vancouver, there is only Lime on Commercial that are likely the only sushi joint of this calibre. If you love sushi and have friends that hate raw fish. Bring them to Kimura. You will both find something you will like, I hope. One of the pleasures of being foodie for me is the exploration and discovery of new food, cuisines and places to dine out at. I recently met someone that was from Tianjin, China. And usually for me all my conversations eventually steer towards food topics. The last person I met from Tianjin brought me to O'tray's at President Plaza last summer. This is a stall that serves authentic Tianjin food. The couple who owns this stall are from Tianjin. And the husband was a chef/cook at a major hotel in Tianjin before immigrating to Canada. So I suggested that she try to visit O'trays. She in turn suggested a restaurant on Kingsway called, "Nine Dishes". She informs me that the owner is from Tianjin and the food was really good. Google map 'steet view' showed a place called 'Pho Mai". Have you ever used this feature? Its pretty neat, isn't it? My memory recalls a Vietnamese restaurant that used to open late and have Karaoke on some night. It perked my interest and I needed a willing belly to join me. I emailed Fmed but couldn't set a date. He goes numerous times in the afternoon the following days but it was closed. On my next available free night I was really hoping that Fmed and Dylan would be available to join. Unfortunately, Fmed had already planned a chowdown and couldn't make it. So it was up to Dylan and I to explore this new restaurant. On the outside awning it says "All You Can Eat $15.99 and Beer $1.99(hope the liquor board doesn't read Chinese)". Upon walking into the Nine Dishes, the reminiscent of the old place was still evident. The aquarium was there from over a decade ago, cleaned with new fishes and reef. The new paint and lights gives the space a newer facade. It was really bright compared to the old dingy campy seedy, dark lighting when it was a karaoke/restaurant many eons ago. While the lighting has improved, I was occasionally annoyed with the light bulb directly above me. Not knowing what to expect we were handed 4 menus. There was two of us in total. Odd, normally each person gets one menu at a Chinese restaurant. Turns out he has four menu, each one with Nine Dishes. There was a menu for appetizer, meat skewers, noodles and main courses. So there are about 36 items on the menu. Each menu was filled with pictures of the dishes with English on it. I started snapping pics of the menu, when IF(the owner) asked if I liked the pictures on his menu. Have you met anyone named IF before? He asked if I thought the pictures on the menu looked god. To which I nodded my head politely and agreed it was. IF(the owner), tells us that he was born in Tianjin and his family moved to Beijing when he was 3 years old. And the food on the menu are dishes that he liked eating when he was in Beijing. Also some comfort food like the lamb congee that his mum use to make(only one person has ordered it so far). Apparently he has been in Canada nine years which he says is another reason he chose the name Nine Dishes. The restaurant has only been opened just over 30 days. And that he has only been cooking for one month(which I am skeptical to believe). I asked IF for his recommendation on what he liked best on his menu, and suggested the boiled kidney in chili sauce($9.99). Dylan ordered the spicy beef slices and tripe($3.99). And we went for a variety of skewers(eggplant, pork with chili, lamb and beef tripe) at a dollar a skewer. And of course a couple of beer to wash it all down. IF(the owner) lets us know that we ordered enough food..... . The kidneys and spicy beef tripe arrived first. I am not a big fan of kidneys, but really did enjoy this dish quite a bit. Both Dylan and I loved the spicy beef and tripe. Dylan and I was hoping they would have some mantou. Which they didn't, instead they have a rice cooker which we later learned that you can help yourself to. No charge! So yea free rice, $2 beer, $1 skewer, $3.99 appies. Hmmmm..... . Seems like a gem so far. If(the owner) theories are one I've never encountered from any restauranter. So far I gather he is either an inexperience restauranter, or out of his mind. But I am not complaining as the $1 skewer soon arrives. With lots of apprehension, that perhaps this is NOT lamb, instead a road kill or worse.... :-D . Actually they use NZ lamb which tasted great, especially for $1 a skewer. His skewers are small morsel of meat compared to N. American standards. Similar size and just as good flavor to the Chinese-Muslim street vendors in China. We ordered another beef slice and tripe. More skewers and of course more $2 beer. Over the course of SIX hours, we try as many things as our belly could handle. Enjoying the easy drinking Yanjing Beer, with and odd mixed of music ranging from Chinese pop to reggae playing in the background. Many classics that I recognized and some very esoteric odd pieces of music. Over the course of the last two weeks, I have been here 4 times. And well, Dylan has literally lived there. Spending almost every night here. And I can assure you the food is very solid and safe to eat. And there have been many surprises each time I dine here. The service is odd to say the least. It can be slow and you need to flag IF(the owner) down for service. IF(the owner) hands you the order pad and you write down what you want. He than writes it in Chinese if you can't write Chinese and hands it to the kitchen where his wife does a majority of the cooking. Whilst IF runs back and forth in and out the kitchen and dining room. You really want the man to succeed but wonder how long he can survive working everyday with very little in return monetarily. Recommends: IF makes his own sausage. It's a Szechuan sausage with numbing szechuan peppercorns. If you have a tolerant of spice and love chorizo, then highly recommended. I've had about 20 lamb skewers and found them all easily edible with no sinew or tough bits. The pork skewer on the menu is actually pork intestine skewer. Which is a love or hate item. Myself and a couple of friends love them. Some can't even look at it. The vegetable balls are a unique textured deep fried semi sweet batter. I like them too. The pork ribs in clay pot is very tasty, esp with a little rice. But beware this one is really greasy dish. Excellent Value. A couple of friends refer to this place now as the $2 beer place. Not rushed, IF lets you drink and eat at your own pace. Excellent Beijing Szechuan street stall food and quality. Lighting can be glaring at times. Tends to leave tables cluttered and doesn't clean up after his guest leaves. Service is not what you expect from other restaurants in the city. If you are timid you may not get served. Would return soon and highly recommend for a unique dining experience. But understand this is not a place for all folks. This was a dinner that is part of the Chowtime's 8GTCC (The 8 Great Traditions of Chinese Cuisine) . It is the first of eight dinners, each representing one of the tradition of Chinese cuisine. The first cuisine was - Hunan. For more info on Hunan cuisine read Fmed's very well summarized essay on Chowtimes - Hunan Cuisine (fmed). Fmed is a well known and respected in the gastronomic scene. You will find him on the Chowhound forums. He suggested that Alvin Garden was one of the best Chinese restaurant in Vancouver and definitely the best choice for the first 8GTCC dinner. Alvin Garden in located on Imperial Avenue, in Burnaby. Some members of the current restaurant used to be to be part of Xiang(Hunan) Garden located on Kingsway. The name Alvin Garden certainly doesn't suit the food served at this restaurant. I would associate the name Alvin Garden to a Chinese restaurant more akin to serving bastardised Chinese food, can you say chop suey, egg foo yong and sweet and sour chicken balls. But never would I consider it an authentic Hunan Cuisine Restaurant based on the name. We later learn how the name came about when introduced to the owner's son, Alvin. :-D . Of course it all made sense now. On to the main event, the food report. Alvin Garden had recently won awards for two of their dishes in the Chinese Restaurant Awards 2010. A gold for the 5 spiced pork heart and a silver for their tea-smoked duck. Both were served at our table this night. In total we sampled 17 items on the menu for this dinner. That's right 17 items, it may have been 18. Yikes! Here is the list of what we had, the item# and cost on the current Alvin Garden menu. Hunan cuisine is spicy. The heat comes mainly from chili peppers rather than the better know szechuan cuisine which derives its heat from the tongue numbing szechuan peppercorns(BTW did you know that they are not really peppercorns?). Overall I felt that the restaurant dialed down on the heat to cater to the diners for this dinner. Though a simple request to the chefs and I am sure they can accommodate your spiciness tolerance. Besides the tea smoked duck and 5 spiced pork heart(very unique texture not as weird as it may seem), I really enjoyed the Stir fried garlic bolt with Hunan smoked pork and the Hunan braised pork. They also have a version of the Hunan smoked Bacon with bamboo shoots on the menu. Which I will order the next time at Alvin Garden. I love the 'Hunan' bacon. Smoky and crisp. It seemed like everyone at this dinner enjoyed their meal. There was something for everyone to enjoy. I was kinda in a gluttony comatose at some point from all the food, spiciness and flavors. That is a lot to taste and dechiper, between the spicy food and conversation I lost track of what I was eating toward the end of the dinner. Note: There was 13 people per table sharing this meal the actual cost if it wasn't part of 8GTCC would have still been under $25 per person. Since opening it's doors in 1999, Cioppino's Mediterranean Grill has been on top of the Vancouver culinary scene. Under the diligent guidance of chef and owner Pino Posteraro who consistently delivers his best to ensure a memorable meal for all his guest. Italian cuisine was a cuisine that I had great affinity too since I was a child. So it was one of the first cuisine I tried to learn. Whilst working at an Italian resto in the 90's, I really wanted to better understand the finer aspect of this cuisine, I asked my Italian chef what restaurant or whom was the best in Vancouver. Without hesitation he declared that 'Pino' was the man. That was a remark that has stayed with me through the years. Chef Pino arrived in Vancouver in 1996 to work for the Vancouver's original food don, Umbertho Meghi. I'll save stories about Umbertho Meghi for next time. Chef Pino had previously worked in Toronto, Singapore and Itay. In Singapore while at the Marina Mandarin Hotel he learned and master sous vide cooking under Michelin star Chef Jan Gundlach. Cioppino's features an open kitchen and you often see Pino conversing with his dining guest. The menu is seasonal but some item like the Pappardelle with 4 hour braised veal cheeks and porcini mushrooms stay on throughout the year. On this evening that I visited the restaurant I was noticeably under dressed. Which is what happens when you live in Vancouver long enough. Well actually it was because we haven't made concrete plans. Was meeting a friend that was leaving for Amsterdam the next day. And she asked me about this Italian restaurant that I had talked about. "Cioppino's! ", I proclaimed. Never one to turn down a good dining experience, I gladly agreed. Restaurants in Vancouver generally do not enforce dress codes, but tonight I felt under dressed in my jean and polo t-shirt. Tip: professional waiters immediately figure out who you are and what you want in seconds. For various reasons, most notably to best served as you would expect. But more importantly for their bottom line, better tips. :-D . Despite feeling rather grubby, I stayed focused on my mission. Which of course is always, good food. Service at Cioppino's is very good. All night we were well taken care of and given proper attention. I was happy they didn't ask me to put on a coat or blazer to enter the dining room. We decided on white wine and left it at the sommelier's discretion to decide what was best. We had two dry whites, the first was an easy drinking northern Italian, the second was more full bodied, southern Italian. Sorry but i didn't get the names of the wines. They were both very good. It matched and paired well with what we were having. We were served some bread and rillette. I couldn't make out what rillete it was as i couldn't understand what the bus person was saying. I asked twice, but still failed to make out what he was saying with his heavy accent. Neither the bread nor the rillete were impressive. On to ordering and the food. Started with the classic lobster bisque served with crab-apple-celery root remoulade. I almost never order lobster bisque anywhere but at finer restaurants. Mainly because it is almost always artificially flavoured with some stock base. Lobster shells are not always readily available. There are lots of 'cheating' that goes on in a professional kitchen for different reasons. Safe to say Cioppino's is NOT a restaurant that would take the easy way out. Contrary, Pino runs his restaurant like a big tight knit family and holds everyone accountable to ensure you have the best experience possible. The bisque was the best balanced lobster bisque I ever had. While the lobster flavor wasn't dominant, it was enough that I really enjoyed it. Next, I had the seared Qualicum Bay diver scallop with roasted porcini and black truffle vinaigrette. I read that this is one of the dish that the Sedins like. Not sure which one. The scallop was fragrant, sweet and tender. With the middle just slightly raw, which contrasted well with nice searing on the outside. The roasted porcini gave this dish some 'oomph'- a fuller bodied flavor and the truffle vinaigrette just perfectly lightly scented and completed this dish. For my main course I choose a flavour I was familiar with, Milanese Veal 'osso buco' with safron risotto. Having made osso buco numerous times and eaten osso buco in Milan, I wanted to taste Pino's version. His presentation of the dish was clean and easy to eat. The meat was just tender and I could be detach the bone off the meat easily. The veal texture was similar to a nicely braised beef. I like it but not blown away. The risotto was cooked perfectly. My dining companion had the Risotto with dungeness crab and herb peas. This was one of the best risotto we both ever tasted. After the meal, as Chef Pino walked by I smiled and said "Hello Chef", he looked right at me and followed by giving me a very welcoming and friendly hand shake, to my surprise. We proceeded to chat for a couple of minute. Chef Pino has a very humble demeanour, but commands respect because he would only ask of you what he would only ask of himself, to work to the best of your abilities. His dedication and hard work has earned him national and international accolades. All very well deserved, imho. 2 starter, 2 main, 3 glasses of wine - was about $200 total with tips. Not cheap for sure. And certainly not within the means of your everyday meal. Perhaps a special occasion. It is still the best Italian restaurant in the city. There were no food-gasm's or epiphany on this night. Even if I could fly to Italy, there are not many places that will serve a better meal than at Cioppino's. And it shows, they are always busy everynight. Certainly, there are better value elsewhere. Reservation is recommended. Definitely will return. Very good service. Pino understands that you have to staff accordingly to serve his guest. Very consistent high level of food execution. Over 200 wines. Easy to find that perfect complement for your dinner. Many will find his prices too expensive. Legendary Noodle on Denman is celebrating their 3rd anniversary and offering free noodles on Sunday May 2nd. A quick report on Legendary Noodles. They have 2 location. One on Denman street and the other on Main Street. Their richmond location is closed. Brock Li and legendary noodles was one of the featured guest on Bob Blumer's Glutton for Punishment episode about 'Xiao Long Bao(Shanghai Steamned Soup Dumpling") on the food network. The location used to be an Italian Coffee shop. Walking into the restaurant you notice lots of chinese trinklet and props. I think it works but still a little tacky. Famous for their hand made noodles which are chewy and starchy. Good bite. Had the lamb noodle soup, found the lamb to be tender but the broth lacking of flavor. The steamed juicy pork dumplings were saltier than most I had. Nothing in this neigbourhood to compare it too. But not as good as Lin's on Broadway. The 'Chao Shou' lemon chicken dumpling in a spicy peanut sauce was interesting to me. Tasted a lot like the description. It was a chicken jiao zi(northern chinese dumpling) with lemon juice in the filling. Served in a bowl with a Tan Tan Mien like broth, a spicy peanut broth. The combination of lemon juice, chicken dumpling and peanut sauce worked for me. And i did like this the best. The new japanese server was very accomodating and friendly. Whilst it is unlikely I would make a special trip back here due to better and cheaper options elsewhere. For those in this neigbourhood, it is worth considering. Thanks Ben for letting me know that my comment setting wasnt working properly. Problem fixed and should be able to leave comments now. One of my favorite indulgence is a French croissant. Crisp on the outside, with over a thousand layers of filo thin butter pastry. Like many food outside it's original region of origin. Finding a suitable replacement is not easy. In the case of croissant in North America, the three major ingredients used, which are flour, butter and yeast are very different to the ones used in France. The cost of importing the ingredients are cost prohibitive and therefore local sources have to sourced. Baking more so than cooking is a science where little variance can have significant results. So when Laurent and Bernard (not sure about the spelling of their names!) decided to open their own bakery. They spent over a month experimenting and trying to recreate products that are similar to their Native land. Bernard has an engineering background, is Chinese but was born in France. Laurent appeared to be more of the baker. She had traces of flour on her. :-D . Bernard tells me proudly that all his baker are from France or trained in France. I don't doubt him. When I walked in there were some bite size pieces of cake and baguette for you to sample. I did not hesitate and was immediately pleased. Looking around, the store was sparsely decorated and furnished. I am told they've been opened for six days. Their window display baskets just arrived and the menu board should arrive shortly. In the refrigerated display. There were sweets patisserie and petit fours that all looked very delicious. Noticed they were not all perfect asymmetrical and 'big like Texas' that you find in many more North American displays. A lot of them dainty and pretty. The prices started at a dollar with nothing over $6. They are looking to add some breakfast and lunch items. I asked him what his favorite items were and he gladly explained them to me. He also sliced some saucisson(French Salami) for me to try. It was very nice and moister than the North American salami. Appears like they are just working out the kinks. Which is true for any new business owners in a new city. There wasn't a line up but the people I spoke to, all suggested they loved it or were looking forward to trying Baguette and Co. Eventually I settled on a croissant and a shot of espresso. The espresso was served very similar to in Paris with a dark chocolate. And tasted similar to espresso I had in Paris. The croissant had a nice crisp on the outside but lack the flakiness, buttery layers and fluff that I was hoping for. It tasted good but lacked the texture and buttery flavor. The espresso and croissant were each $2, which i though was very reasonable. I ended with a couple of boxes of pastry to go. Was able to share them with others. The feedback from everyone was positive. I am definitely returning. Hope that they are able to work out their kinks. 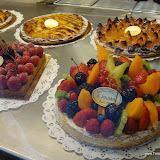 Here are a few pics and link to my favorite bakery in Paris. The brioche and croissants are the best I've ever had. It was divine and wish I could have such a nice treat more often. Happy eating y'all! Chinese Restaurant Awards 2010 in the City voted to have best chinese food in the World? Note the critic's choice signature dishes. Helpful to know some of the dishes to order when you are visiting some of the top Chinese restaurants in the city! In the February issue of travel magazine Conde Nast, writer Mark Schatzker claim's that Vancouver has the best chinese food in the world. Is it possible that a North American city can lay claim to having the best Chinese food in the world? A city with a population of just over 600,000 people? Huh, better than the source of Chinese food, China? Better than cities like Beijing, Shanghai, Guangzhou, Qingdao, better than food loving cities like Hong Kong, Taipei, Singapore, San Francisco, New York? Hard to believe, but apparently he has traveled and eaten Chinese food in many Asian and North America cities and was blown away with the Chinese food in Vancouver. Nice job Vancouver! Seems like the list of restaurant are pretty much set. The best value are normally in the $38 just because it gives the Chef the opportunity to use the best ingredients to make a more memorable meal. While I haven't been to all the restaurants on the list. I think that a lot of the better restaurants are staying off dine out partly due to it happening much later in the year due to the 2010 winter Olympics. Dine out usually happens in February. Dine out was a way to promote the city and get people out to restaurant in the slower time in the year. When dining at a new restaurant, one of my first question and observation is, "How long do I think this restaurant will survive?". I understand that this sounds so negative of me. But I feel it is a more a reality. If you look around the city there are new restaurants coming up, but for every new restaurant about 70% fail within 3 years of opening. Pretty scary when you consider the cost of of opening a new restaurant at between 40k-2million. Seems like a lot of wasted resources. So i digress, but going to a new restaurant can be like going on a first date. Sometimes it can be a blind date when you know nothing about a place. You never really know how it is going to turn out. You always hope for the best but try to prepare yourself for the worst. So whenever I find a new restaurant I like, I get really excited and cant wait to go back. Hence, I get disappointed when I learn they have closed their doors. Nook joins the new trend of restaurant that are offering choices for diners that like to eat well without having to take a mortgage. It is run and operated by the same same folks at Tapastree. Was there a couple of months after the opening on a weeknight. Was asked if I had a reservation. He looked surprised when I said i didn't. Waited 10-15 minutes to be seated at the bar. Didn't feel very welcome at the door. Also there wasn't much room for waiting. The restaurant was small, probably a 30+ seats. With an open kitchen, and bar. The space was cosy but a bit cramp, I thought. Room was narrow and small. There is about 5-9 employees total. Once seated at the bar, the server/bartender was very warm and welcoming. There was some nice conversation at the bar. Same thing I notice at the seats at the kitchen bar(Chef's Table), Chef/Owner/Cook Mike Jeffs was jovial and chatty. During the course of the night we were served slices of their prosciutto and salumi(Oyama) on the house at he bar. The bar also serves as the cold station preparing the salads and plating the desserts as well. The Chef has never been to Italy, but yet his take on Italian cooking is better than most Italian restaurants it town. Using quality ingredients and solid proven cooking techniques, his Italian food is straightforward and unpretentious. The pricing is affordable. For the price you would be hard pressed to create and cook the same meal at home. Whilst there are no foie grais instead they use chicken livers, not truffle shavings but there are truffles in salami and instead of an 8oz steak they settle on filet mignon meatballs. I have heard conflicting reports regarding whether they make their own pasta. My hunch is that they make their own gnocchi and but buy in their pastas. I did find the menu too heavy on starches (crostini, pasta, pizza). Nook is not a North American Italian restaurants which are normally heavier on the sauces. Everything about nook is straight forward. From the food, drinks and service. The straight forward casual cooking with the best sourced ingredients falls short of incredible. I love sparse seasoning and light sauce, just enough to coat the noodles. Like you were to get in Italy. The thin crust pizza was a simple pizza dough with nicely thought out ingredients and the liver crostini was delicious. The salad were fresh with a rustic feel. The service was inconsistent but very acceptable. Nook has a lot going for it. The pros outweigh the cons. Unlike the many failed restaurant ventures, Nook is a well thought out restaurant that will remain in business for while. Well looking forward to writing more reviews and comments, in the mean time enjoy the pics. happy eating y'all! The search for a true spanish tapa's eatery in the city has proven futile. La Bodega was my first experience to spanish tapas's style meal. I was immediately fond of this expereince. And felt it was a lovely way to spend an evening getting better acquanted with friends. Enjoying an assortment of dishses with many flavors and some wine to complement the meal. Tapastree provided a more modern setting when they opened in 1997. And then Gord Martin's hipper Bin's, was introduced and Vancouver was set into a tapa's loving city. There have been many restaurant's that have come, tried with some or little success. Most with a new twist to Spanish Tapas. Which always made me wonder, why no one tried to bring a more authentic experience to Vancouver. So when I heard about Barcelona and Judas Goat I got excited and hopeful. I manage to make it to Judas Goat on a late weeknight evening hoping to avoid a crowd. Sean Heather has added his third eatery after Irish Heather and Salt. He has slowly built a reputation in the industry, learning his craft the hard way. His early mistakes in the begining have made him stonger and wiser today. Chef Lee Humpries presides over the food at Judas Goat just as he does for the other two establisment. The glass and concrete walls balanced the marble and composite plastic stools in this small 25+ seater eatery. Giving it an industrial chic. It is located in Blood Alley, an alley that some would have never considered walking through at night just a decade ago. But improvements and devlopment has seen many businesses enjoying success in the outskirts of downtown where rent and leases are much more profit friendly. Once inside I was greeted and sat along the banquettes along the wall. Was explained how the ordering worked and I quickly glanced at the 'menu'. The menu was a sheet of paper with boxes for you to fill with pencil the quantity of each item you wanted. The entire room was small, no larger studio apartment downtown. Less than 800 sg ft, I think. There was no kitchen or bar that u normally see in other places. Salt located next door also has no kitchen, so I assume that the food prep and hot cooking would be done in Irish Heather. The selection of wines was good for such a small place. And they have cider on tap. No beer on tap but the selection of beer were unique. I liked the bubbly and sangria(too small of a glass, though). The drinks sizes was small which was nice which meant you could try different drinks during the course of the night. The crostini's are nice, chorizo with chocolate odd tasty combination. Not a fan of them preparing all the crostini' ahead of time. The pork was fatty, fork flaky, almost melt in you mouth that I am sure many will like. The brisket meatballs were wonderfully moist without an overpowereing tomato taste and balance with a slightly salty cheese. The lamb cheeks, savoy cabbage in truffle oil was gamey and flavorfull. The truffle oil was evident almost overwhelming, but I felt in wasnt needed. The rabbit rillete with carrot panna cotta was really good. Especially the the carrot panna cotta!. Veal sweetbread was dissapointing as I love sweetbreads and wasnt expecting the way it was prepared. Always thought saltimboca meant sauteed. The food was good, but not outstanding. Rodney's Oyster House - Oysters! Oysters! Oysters! I know there are many who are squeamish about eating raw oysters. The thought of a raw life bivalve mollusks down your throat can be unnerving. Can't blame anyone for not wanting to try raw oysters. Which is great for folks like me that love freshly shucked oysters. Naked or dressed! I generally avoid raw oysters at buffets and restaurant with low turnover. No point taking chances for health reasons. There are hundreds of varieties, each with distinctive characteristics. Often taking on the flavor of it's habitat. An oyster’s taste comes from the area it’s harvested. There are three broad classifications: Pacific, Atlantic and Olympia. Each is further broken down to the very shore from which they are harvested. The names of Oysters are sometimes base on where they are harvested from. Some of their names include Kusshi, Kumamoto, Cortes Island Oysters, Samish Bay, Steamboats, Pearl Bay, Malaspina, Royal Miyagi, Malpeque, Caraquet, Blue point, Pine Island, Pugwash, Effingham, Blue Points, Fanny Bay, Hood Canal, Tomales Bay, Hog Island, Cheseapeke Bay. Note how many of these are named from a geographic area. But most oysters fall into either the Pacific(West Coast) or Atlantic(East Coast). The finer restaurants always gets the top pick of oysters available before you see them in your supermarket. As far as restaurant in Vancouver for oysters, my pick's are, Rodney's Oyster Bar, Blue Water, Joe Fortes, and Coast as my go to spots for oysters. But purely based on fresh oysters, I would pick Rodney's. So here is my blurb on Rodney's. Rodney "the oysterman" Clark has been serving oysters with a Maritime hospitality themed in Toronto for over 20 years. They have one other location in Toronto. The Vancouver location located in the trendy Yaletown has been going over 10 years strong. It is a small two level place that probably sits 50-60 people with a 'Maritime Room" room available for up to 30 for private parties. You can dine by yourself or with your dining mate at the oyster bar. Where you can watch the 'oyster-tender' shuck your oysters place them on a bed of ice and grate fresh horseradish. They have 5-10 different variety of oysters for you to choose from. Though it is based on availability. So best to go early for dinner if you want the best selection. There are three item's I am fond of on the menu, besides the fresh oysters, I like the pan fried oysters and bloody caesar's with fresh grated horseradish and a cocktail prawn garnish. I have not enjoyed any other food items that I have ordered whenever I go to Rodney's. I like the individual steam soup kettle that they use to make the chowders and steam the mussels and clam. Unfortunately the way they prepare them lacks flavor and taste. The chowder are very basic and bland tasting. Too bad since they have a perfect set-up to deliver great tasting shellfish chowders, soups and stew. They do have a modest selection of beers, wines and champagnes to go with your meal. They do offer a few wines and champagnes by the glass. Sumac Ridge Stellar’s Jay Brut, and the Weingut Kruger-Rumpf Riesling (Germany) worked really well with the oysters. I really like the caesar's with fresh grated horseradish and cocktail prawn garnish. Price wise, it can get expensive as oyster doesn't really fill you up. With prices of about $3 or more per oyster. The bill can add up real quick. And they lack of solid main courses really hurts making Rodney's a serious dining destination. So I paraphrase. I come here only for the fresh oyster. And stay for some more oysters. They generally have the best and freshest oyster selection in town. Come early for the best selection, as they do run out of some variety later in the night. Sitting at the oyster bar and making conversation with your oyster shucker. Most of the other food items are kinda flat and bland. Gets busy and sometimes loud. It's a small room so not an inimate setting.